I've talked before about Sir Ken Robinson, particularly on our Facebook Page. Sir Ken has written and presented extensively about education. If you haven't heard him speak before, you must watch Do schools kill creativity? and Changing education paradigms. The themes of these two presentation above feature in this next presentation (below). Because I know these two presentations so well, I kind of zoned out a bit, but at 15 minutes, I snapped to attention. There are three types of people in the world - those who are immovable, those who are movable, and people who move. There are conditions under which people thrive. And conditions under which they don't. We are after all, organic creatures. And the culture of the school is absolutely essential. Culture is an organic term isn't it? Not far from where I live is a place called Death Valley. Death Valley is the hottest, driest place in America and nothing grows there. Nothing grows there, because it doesn't rain. Hence Death Valley. In the winter of 2004, it rained in Death Valley. Seven inches of rain fell over a very short period. And in the sprint of 2005 there was a phenomenon, the whole floor of Death Valley was carpeted in flowers, for a while. What is proved is this - that Death Valley isn't dead. It's dormant. What's right beneath the surface are these seeds of possibility waiting for the right conditions to come about. And with organic systems, if the conditions are right, life is inevitable. It happens all the time. --- the real role of leadership is not command and control, it's climate control. In our break yesterday I was able to attend a workshop at Sami allaskuvla Sami University College titled 'The World Indigenous Nations University - Indigenous capacity building'. Professor Boni Robertson and Jan Henry Keskitalo walked us through the journey that started in 2012 of trying to establish a World Indigenous Nations University. The World Indigenous Nations University (WINU) was proposed in 2011 at the World Indigenous Nations Higher Education Consortium (WINHEC) Executive Board general meeting in Cusco, Peru and approved for establishment at the 2012 WINHEC Executive Board meeting in Hualien, Taiwan. WINU seeks to build knowledge, understanding and skill for Indigenous Peoples across the world from our sovereignty and knowledge systems. It aims to address the challenges faced by Indigenous peoples across the globe by providing access to a system if higher education that is culturally and professionally appropriate and is aligned with a strong commitment to advancing Indigenous people through education. WINHEC seeks to establish a global Indigenous university which privileges and promotes Indigenous knowledges, Indigenous leadership and pedagogical framework in the spirit of the sovereign rights of Indigenous peoples to their own education systems. To develop and sustain Indigenous leaders and professionals who are scholarly, culturally astute and practiced in fields relevant to and specific to Indigenous knowledge and leadership. It will be interesting and exciting to watch this initiative over time. Pic: Sorry for the grainy pic. Approximately 800 children and young people from 7 Indigenous regions from Finnmark Country and France were invited to submit a picture of their dream home/lodge. The images, as you can see above, are displayed on a Jielli (Northern Sami), which is a structure for drying fish. This work inspires me. I love how children express their ideas. They're straight forward and simple, uncluttered by "politics". I'm thinking about how I could develop this activity for when I return to Sydney. Drawing on the idea of the "fish", we could explore fish nets and fish traps, creating a similar structure using found wood and string or light wire. We could build a "display" structure. And rather than a dream home or lodge, I might ask students to draw their perfect meeting place. Will continue to explore this activity more when I return, and update this post later. Our team member, Lisa M Buxton travelled to Norway this week to attend the Global Indigenous Preparatory Conference for the World Conference on Indigenous Peoples (to be held in New York, Sep 22-23, 2014) . 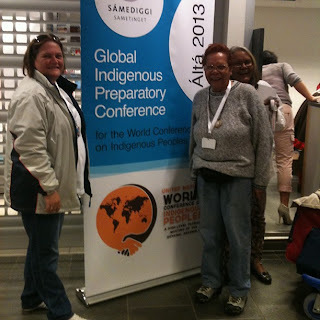 The event is being hosted by the Sami Parliament and is being held in Alta, Norway. Technology permitting, Lisa will be sharing posts with us along the way. The 21st of March is the International Day for the Elimination of Racial Discrimination. Each year we mark this Day on the anniversary of the 1960 Sharpeville massacre. We can never forget the 69 unarmed and peaceful demonstrators who were killed by South African police as they protested the country’s unjust apartheid laws. Apartheid has long since been dismantled and there have been other important advances in the struggle against racism. These include treaties and declarations, the development of an international framework to combat racism, and national protection systems by numerous States. Despite much progress, racism remains a pervasive menace to individuals and ethnic and religious groups worldwide. It is a threat to stability and a grave violation of human rights. We must join forces to end racism, and sport can help reach this goal. On this International Day, let us recommit to ending racial discrimination and realizing our vision of justice, equality and freedom from fear for all. It is my personal experience that Australian's do not have a sophisticated understanding nor an ability to identify, talk about and/or critically reflect on their own racism - individual, institutional and systemic. "I'm not racist" is frequently heard in the media as a defence. I would argue that probably all of us are racist to some degree or another. It doesn't make it okay of course. But it does mean that when you attempt to defend yourself with "I'm not racist", you look, sound and probably are being absurd, and un-productive. It takes a long time to grapple with one's own racism - to be able to self-identify it, to challenge it. It's an ongoing journey of reflection and personal challenge. In Australia, other commemorations are also held on the 21st of March. These include Harmony Day and Closing The Gap.